MARC STEINER: Welcome to The Real News, folks. This is Marc Steiner. Good to have you with us. This last weekend there was a rally taking place, a march taking place in Portland Oregon, put on by fascist right-wing groups Patriot Prayer and Proud Boys, and they were countered by other demonstrators who did not want fascists walking the streets of Portland. Interestingly enough, before we start this interview, just a little piece of history to put this in perspective: That Portland, Oregon and Oregon itself were founded as white national places, refuges for white people where black folks were not even allowed to move into. Some of those laws on the books into the 20th century. So take that in context in terms of what’s happening now, because we think of Portland as one of the most progressive, liberal cities in the entire country. So joining us today is Effie Baum. Baum is spokesperson for Popular Mobilization, which has stood up to the fascists coming into the city. And Effie, welcome, good to have you with us. EFFIE BAUM: Pleasure to be here. MARC STEINER: So take us, first of all, describe for us what it was like. What it’s like in Portland at this moment. Which is, in some ways Oregon is still a kind of a, kind of very central place for white supremacist groups. And Portland is given this image as a very progressive city. So could you just kind of set the dynamic up for us? EFFIE BAUM: Absolutely. You are not wrong. Portland and the State of Oregon actually has an incredibly racist history. And not just in the sense of like, you know, more like distant history when the state was founded. 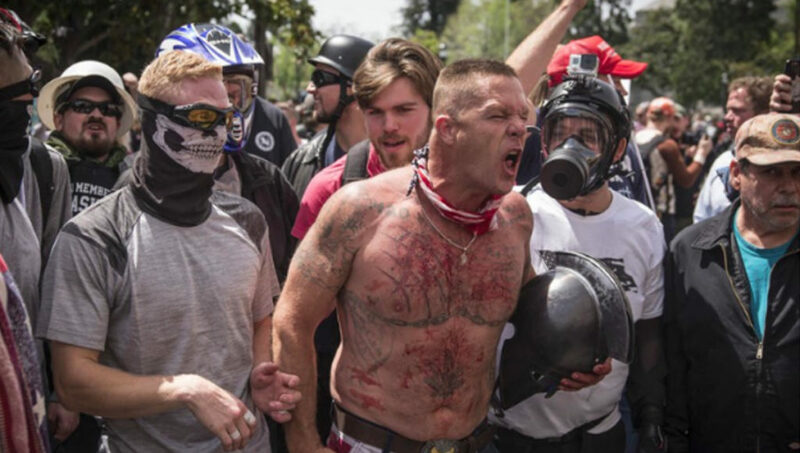 But even as recently as the ’80s and early ’90s there was a very, very active neo-Nazi skinhead population in Portland. And this culminated in a murder of an Ethiopian exchange student in 1988 named Mulugeta Seraw by a neo-Nazi gang called East Side White Pride. And there had been a lot of racism that was happening in the city at that time, and that murder really sparked the community to finally stand up and fight back. And over the course of the next several years, multiple organizations formed, and a coalition of more than 30 organizations formed to stand up against these groups, and kick them out of the city. And in 1990, during the trial of [inaudible], a white supremacist that was being held accountable for the murder, a demonstration took place that was put together by these 30-plus organizations and coalitions despite interference to try to prevent the rally from happening by both the Portland Police Bureau and local media in the city. And they succeeded in having a very successful rally, and then we did not see as much neo-Nazi and white supremacist activity for the last 20 years until just the last few years, since the rise of white nationalism and populism, and Trump. And now it’s back. And so we do have this reputation for being incredibly progressive liberal stronghold, but we have had this dark history as long as the state has been around. MARC STEINER: So I wonder how you feel that plays out day to day in Portland, as you witness it. I mean, we see this rally taking place, which I want to talk about in just a moment and really get to the heart of what happened on Saturday with your police tacking the counterdemonstrators. But does this play itself out at all in the streets of Portland when demonstrations are not happening? EFFIE BAUM: Absolutely. And we’ve seen an uptick, especially the last few years. But that’s not to say that it has not always been happening. It’s not more than a few days go by that I don’t hear about an attack on a person of color, a trans person, an LGBTQ person, any kind of marginalized population. People are getting verbally assaulted, physically assaulted, and harassed in our city all the time. And these attacks have only intensified over the last couple of years. MARC STEINER: One of the things that has been reported by some of the media is that when these demonstrations took place, the police came in to stand between the two demonstrations, the right-wing kind of racist fascists on one side, and your mobilization on the other. The police in the middle. But all the other reports I read said that when the violence took place, when the police started pushing back, it was your mobilization that got pushed back, and not the fascists. I mean, what did you witness? EFFIE BAUM: I was actually right there at the front when they started attacking the crowd. I was actually right in the middle of it when it happened. And what I witnessed was a nonviolent demonstration undergo a completely unprovoked and violent assault by the Portland Police Bureau. And one point of clarity, just because it’s really important. Our group, PopMob, mobilized a contingent. There was also a huge organizing effort that was undergone by other anti fascist groups within the Portland area, and we all came together as one unified antifascist group. But I don’t want to, I don’t want to take all of the credit for that mobilization, because there were other organizations working at the same time with the same goal. MARC STEINER: So I’m going to play a short clip for you that was pulled out of Fox News. And the conversation is taking place with the former head of ICE. And they talked about the moment the other week when Antifa, groups associated with Antifa, took over the ICE headquarters and raised the ANTIFA flag in their headquarters. And this was their response. The gentleman on there was Thomas Homan, who is the former head of ICE. And this exchange took place, and I want you to listen to this because I’m really interested in how this may play out in terms of why you think you were the target, as opposed to the fascists. But let’s see what this says first. THOMAS HOMAN: Matter of fact, they hung their Antifa flag up where the United States flag was. LAURA INGRAHAM: Wait. They took down the U.S. flag. They climbed the building, they took down the U.S. flag, and they replaced it with an Antifa flag? THOMAS HOMAN: Yes, ma’am. And the patriots at ICE, when they took the building back, first thing they did is raise the American flag back up. LAURA INGRAHAM: You know, the only thing I can think of that’s like that is when ISIS was rolling through parts of Iraq, and they were going into those Christian villages in Mosul, and so forth. They were, they were knocking down those churches, taking off the crosses, and raising the ISIS flag. I mean, it’s a form of domestic terror. MARC STEINER: A form of domestic terror. So I won’t make any commentary on Ms. Ingraham or Mr. Homan. But in all seriousness, I’m curious how this idea feeds into, for you, why you think the mobilization was attacked and pushed back in violent ways, and the right-wing racist group that is doing the march in Portland were not. If that, in fact, is how it occurred. EFFIE BAUM: Sure. I actually have several points I want to make in response to that. MARC STEINER: Please do, go right ahead. EFFIE BAUM: So the first thing that I just want to make sure that we’re very clear about is that ‘Antifa’ is a word that is short for anti-fascist. Antifa is not an organization. It is not any kind of formal group. It is simply short for anti-fascist. And anybody who has anti-fascist views could ostensibly be Antifa. It’s the same thing. There has been a stereotype and stigma attached to the term because it has been conflated with a certain kind of demonstrator. And it is actually a term that is not associated with any one group. So when we talk about Antifa, it’s a way to try and vilify and criminalize a group of people that doesn’t actually exist as a specific group of people. So I just want to be very, very clear on that. There is no such thing as Antifa in the sense of any kind of organized action or group. That’s the first point I want to make. It’s a way of just creating another bogeyman. And, and I would say that anybody who is opposed to white supremacy and racism, and sexism, transphobia, homophobia, all of these issues that we see coming through all of these white nationalist and hate groups, anybody who’s opposed to that would be an antifascist, and therefore Antifa. So that’s the first point I want to make. Second, to associate people who are opposed to hate and violence against marginalized populations with terrorism is absolutely appalling, and especially coming from the head of an organization that is actively separating families, ripping children from the arms of their parents, and then losing them in the system and leaving them to be sexually assaulted, neglected, and abused by an organization with apparently no oversight. And we’re the- antifascists are the terrorists? I find that to be a level of cognitive dissonance I cannot even fathom. So in regards to how that relates to our action on Saturday, the thing is, Portland-. This is not the first time this has happened in Portland. It is not unusual by any means, and I don’t think that the police violence we witnessed on Saturday actually had anything to do with the ICE occupation or any of the recent actions regarding ICE in Portland. What the attack on the antifascist side had to do with is the fact that we have a city police force that has a long history of associating with white supremacists, known Nazi sympathizers in its ranks, and a long track record of repression of antifascists and left activists in the city, and often very violent repression. This was just another example of the Portland Police Bureau’s wanton use of extreme force to repress speech that they don’t agree with. MARC STEINER: And that’s happening in a city that we all look at in America as one the most progressive cities in this country. EFFIE BAUM: This is true as well. But we also need to address the fact that the institution of police is, at its core, a white supremacist institution built on a history of controlling slaves. So it is not just the Portland police bureau that is, like, suffers from this issue of institutional white supremacy. It is the entire instituion of police. So it is not surprising that an organization founded on white supremacy would be attacking fascists that don’t agree with their agenda. MARC STEINER: So finally, let me ask you this last question before we go. Obviously we’re having this conversation, and we’re videotaping this, and this is a visual conversation. But you decided not to come on the program and have your face shown. And you want to do this by phone because you were worried about your own safety. So talk a bit about that. Why, what are you worried about? EFFIE BAUM: It’s a number of things. We see that, you know, the right has a habit of doxxing, which is, for those that aren’t familiar, putting the personal details of people they perceive to be their enemies online publicly and encouraging violence and harassment. So for my own safety I have chosen not to do any on-camera interviews that show my face. I have all of my social media with no pictures of me publicly, just because of fear for my own safety. But my fear for my safety does not, it is not so much that it prevents me from wanting to speak out, because I think that it is so important to oppose fascism in all of its forms, even if it means that we are putting ourselves at great personal risk to do so, because it is that important. So I take whatever measures I can to protect my safety, knowing that there is no guarantee that I will always be safe. And it’s not just the right that I’m afraid of. State repression is also a very real threat. MARC STEINER: Effie Baum, I deeply appreciate your taking time to talk with us today. It’s been a pleasure to talk with you. EFFIE BAUM: Thank you so much for having me. Effie Baum is a spokesperson for the Popular Mobilization in Portland that countered the right-wing racist demonstration that took place on August the 4th in Portland. And she joins us to talk about her experiences and what the political situation is in Portland, Oregon at this moment. And I’m Marc Steiner for The Real News Network. Thank you so much for joining us. We’ll be talking together soon. Take care.